The Australian Government has signed up to a second period of the Kyoto Protocol for 2013-2020 with greater coverage of the land sector. This means there will be more land activities that can sell into the proposed Emissions Reduction Fund and international markets. Remaining non-Kyoto projects, such as feral animal management and 'blue carbon', are not eligible under the amended Emissions Reduction Fund. The Kyoto Protocol is the agreement made in 1997 that commits developed nations to emission reduction targets. Australia signed up to Kyoto 1 for 2008-2012 - but we opted out of article 3.4 activities: rangelands, soil carbon, forest management etc. This is because for these activities there was too much variation with drought and fire which could give Australia a big bill in a bad year. This meant that credits from these activities would need to be sold on the voluntary market. Other land categories were not optional and were thus 'Kyoto projects'. Australia has now signed up Kyoto 2 for 2013-2020 - but this time article 3.4 activities will be counted: on the proviso that Australia can account for natural spikes over time, not just in one year. 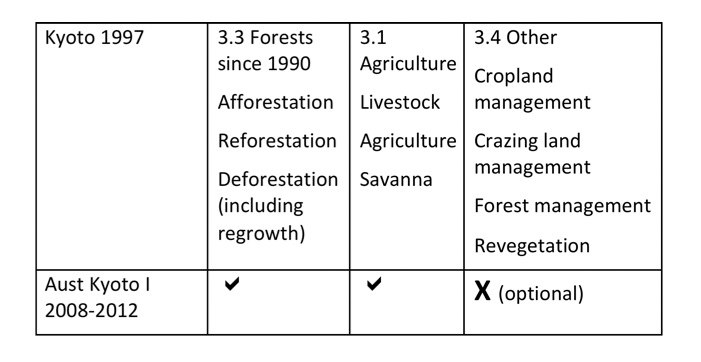 So all kinds of forest, grazing and rangeland projects will be 'Kyoto projects' and will be able to sell into the Emissions Reduction Fund auctions and at better prices on the international market. Feral animal management and 'blue carbon' projects in the sea will remain non-Kyoto activities. CFI regulations have been made to allow Kyoto credits to be issued until 2020, including for 3.4 activities such as soil carbon and rangelands management. Under amendments to the ERF, non-Kyoto projects are not eligible under the CFI - see what it means for Aboriginal carbon projects for details on the ERF changes.